August | 2014 | This is Ashok. Middle class wealth fell – but you shouldn’t worry. Vox reports (but makes no editorial comment on) a Census Bureau chart showing a steep decline in middle class wealth between 2005 and 2011. This is a sensitive topic, and on the heels of Piketty, who advocates a global wealth tax, one that may fuel progressive criticism of increasing wealth inequality. While the economic malaise of the poor is something we need to address, thinking through the lens of wealth is the wrong way to go about it. For one, median household wealth tells us less than a lot about living standards, inequality, or economic power. At least among OECD countries, non-income factors account for a majority of the variation in median wealth. (The relationship is stronger for the per capita counterpart, but that is skewed by a long, right tail.) Income does clearly determine a good bit of wealth, but no one would walk away convinced that the median Slovenian or Spaniard is actually richer than the American. That isn’t to say income per se is an effective measure of living standards either: wealth provides a sense of security and certainty for bad times, but that is surely of second order importance. But the more important point is, if there’s a measure in which a country like Israel is almost as rich as America, it’s a bad measure. At least to measure median economic prosperity. And the problem comes in measuring wealth. While we may think of it in its accounting reality, assets less liabilities, its better to think of trends through a more fundamental definition: that is a claim on future output. Wealth, after all, is the discounted present value of the future cash flows from your net position. That makes a big difference. Not all wealth is created equal. A good amount of the returns from wealth sitting in the hands of the one percent will be taxed between 15 and 55%. A good amount of the returns from wealth sitting in the hands of everyone else will be taxed more or less at 0%. There’s a bigger angle to this as well. Healthcare is going to be a large part of future output, and that’s something we kinda sorta socialized between 2005 and 2011, supposedly the time period over which middle class wealth plummeted. And yet, as we each have a more equal claim on what will be a growing component of future output, implicit wealth inequality falls. Nor does this include social security and disability, which surely represent a big chunk of middle class wealth. 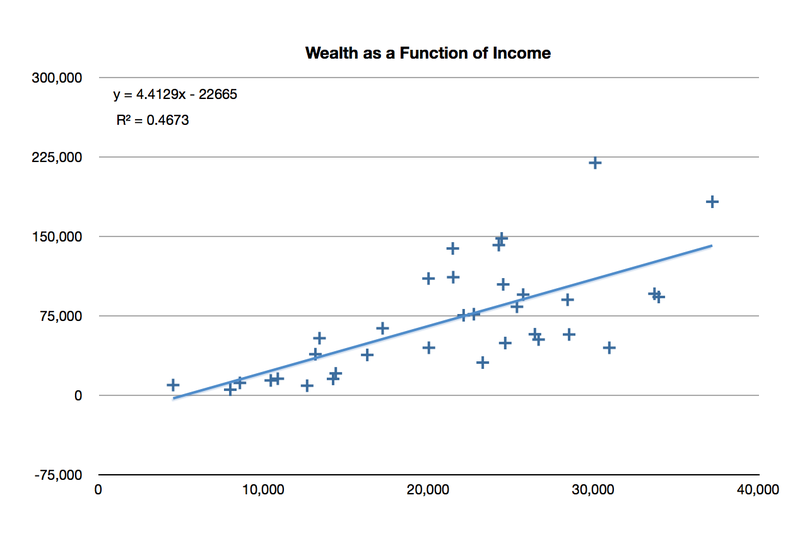 Wealth, unlike income, is intertemporal. Measures of wealth inequality, unfortunately, are not as nuanced. I would venture to say, however, that anyone who thinks the utility of middle class consumption over the discountable future actually fell by 35% in absolute terms better prepare for armed revolution. Rather, implicit claims of more progressive taxes and even more progressive expenditures will probably keep the Bolsheviks at bay. For now. Pranjul Bhandari and Jeffrey Frankel argue that the case for nominal income targeting over inflation targeting is stronger in developing countries than their advanced counterparts. The crux of this argument relies on the increased frequency of supply-side shocks in poorer countries, which require perverse policy under an inflation targeting regime. I’m ambivalent about both the relevance and efficacy of this proposal. It’s a debate we desperately need to have, but it’s not like two of the most important emerging markets (India and China) follow any target to begin with. However, I think nominal income targeting has a few critical benefits the authors (at least in the VoxEu summary) do not cite. Inflation is hard to define, let alone measure, in rich countries. And a lot harder in poor ones. A common measure of inflation in the United States, the Consumer Price Index, considers the price level a representative agent faces. In places like the US and Europe, it’s pretty easy to outline the parameters that define a representative agent, and the basket of goods he consumes. With a bit of econometric handiwork, the Bureau of Labor Statistics (BLS) has developed sophisticated tools to update the CPI to keep it relevant with a modern consumer. Inequality in America may be high, but the overwhelming number of citizens care about the same things: price at the pump, the cost of bread, and so forth. A broad consumption-driven middle-class buys the same stuff. In India, as in many other developing countries, the urban middle-class lives a world apart from its poorer, rural cousin. This has an important macro dimension. The cost of tradables (and hence the exchange rate) matters a lot more for an IT worker in riding a scooter to work than a casual laborer in the heartland of Haryana. There is also a lot of uncertainty around the portion of rural transactions that are even monetary in nature, with informal markets and even non-money exchange an important part of life. So in the United States, when inflation unexpectedly jumps, it’s a little hard to say who the winners and losers are. In India, to the large extent perishables drive prices, jumps in inflation largely reflect higher wages in rural districts reflected as higher prices in urban fringes. There is no representative basket. Measurement in India is also confounded by tricky conflicts of interest. The bureaucrats that estimate inflation have wages expressly indexed to the CPI-IW. This probably is an order of magnitude or two less important than the more philosophical problems with inflation, but given its slight upward bias over the past decade not something to ignore altogether either. Unlike inflation, price level, and real GDP, nominal GDP is something we can estimate pretty well and, more importantly, have an extremely clear definition to work with. This is an enormous advantage in favor of a NGDP based anchor. But currently, India doesn’t target anything, and there’s probably good reason for that. Monetary operations in developing countries are in many ways more complex, if less consequential, than those in advanced markets. For example, the Indian economy is far more sensitive to the exchange rate than most rich countries (especially the United States) are. Sensitive both because of institutional arrangements (such as fuel subsidies) whereby the terms of trade are important and because of volatility in capital flows, particularly short-term debt. Specifically because India imports certain dollar-priced goods (oil, but other minerals too) the exchange rate affects not only demand, as in most countries, but also supply. A depreciation can lead to unsustainable deficits and infectious inflation much quicker than in advanced countries. Fiscal dominance, or at least political interference, is a much larger concern. As Raghuram Rajan noted not long before he was tapped as the RBI chief, by imposing high liquidity requirements on banks – held through Indian government debt – the RBI was effectively financing artificially-cheap borrowing by the Centre. So one may ask – a nominal income target, but in what? Nominal rupees or nominal dollars? Or nominal trade-weighted units? It’s a bit like whack-a-mole. A nominal income target in a foreign currency, while something I definitely need to think more about, comes dangerously close to certain worries of competitive devaluation. However, it does at least intuitively deal with most of the problems of just an inflation target, or just a nominal income target. A final problem with rules-based, as opposed to ad hoc, monetary policy is low labor mobility and dearth of a strong fiscal transfer system. If America is booming, but Alabama is sagging, a deep social safety net via food stamps, unemployment insurance, and social security ensures that an inflation-targeting Fed doesn’t harm Alabama too much with monetary tightening. And wages will move towards equality as Alabamans move out, reducing local supply. But that’s not the case in India, suggesting monetary moves have far more political implications, the rural-urban divide key among these. I find any sort of long-run target that doesn’t consider exchange rates to be worrisome in the world of free and fickle capital. I’ll be writing more about a dollar-denominated nominal income target for emerging markets in the days to come, but am curious to see what people think about this. However, given the problems with measuring inflation I think we can be sure that were India to choose between the two, it should chart its own course instead of copying the Reserve Bank of New Zealand. Is Housing Holding Back the Recovery? Evan Soltas thinks so. With both inflation and unemployment figures finally pointing in the direction of a rate hike, only meek housing numbers portend any extended period of low interest rates. This is important because, as Evan notes, housing has consistently been a key driver of monetary policy and the crash in construction leaves a big dent to this day. I’m a little less convinced this is cyclical factor deserving monetary nourishment as much as a structural change in the housing market itself. This isn’t something I’m too sure about, and this is largely a note for my benefit. 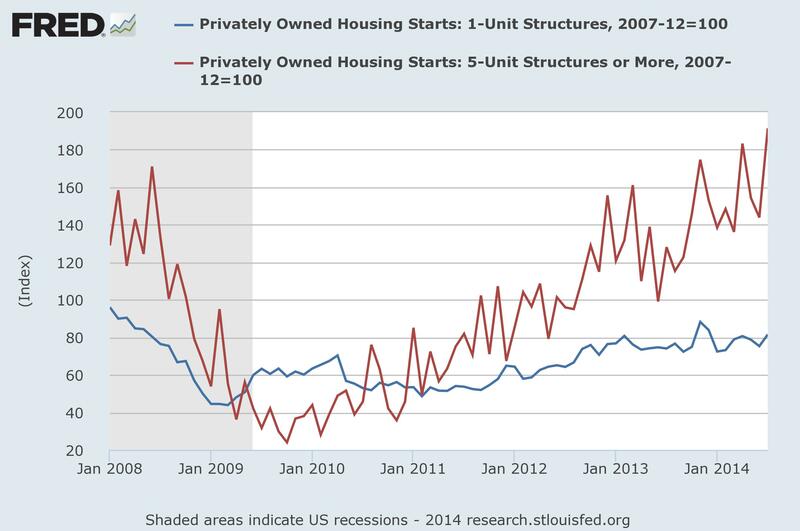 While Evan says “It [the weak recovery] is no less apparent if you include multifamily housing”, I’m not so sure. Now, single-family houses are definitely the most important part of the market, which is why a weak recovery in 1-unit structures will persist in a graph of the market as a whole. But the consistent improvement in 5-unit housing starts, that is apartment buildings, is curious. It tells us a little bit about where the recovery is and is not. People in New York City live in apartments, people in Tennessee do not. It tells us a little bit about the changing structure of home ownership. People rent apartments but own houses. And surely enough, rental vacancy has fallen over a third from its double-digit peak in 2009. The divergence in housing starts is just the market responding the a change in consumer preferences. A reasonable doubt may be that consumers are starting to rent precisely because the recovery is so week, and that I am diagnosing a symptom, not the disease. However, that is unlikely to dismiss this theory. Homeownership rates have been in persistent decline since well before the crisis, and the recession didn’t really accelerate the trend. This is a trend that will certainly become more important in years to come. While Evan is worried that the housing market remains depressed, the rental market is headed towards steamy recovery. 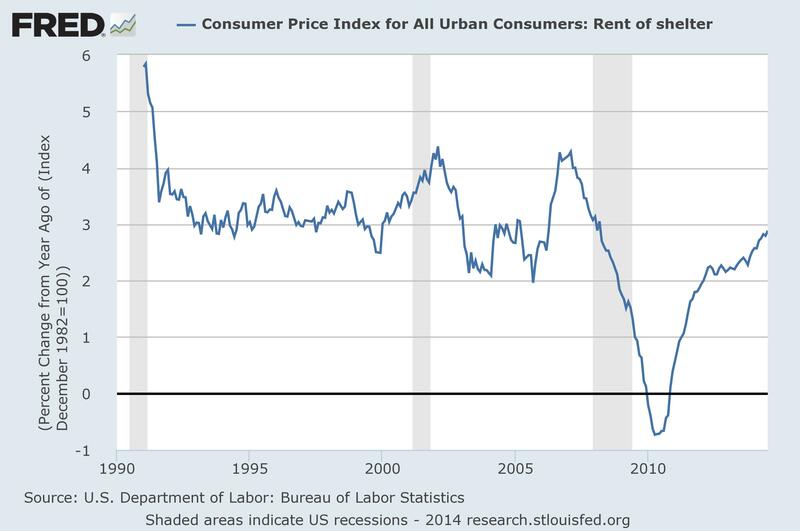 That kind of “v” recovery in rental prices is exactly the kind economists love to see. Unfortunately it’s not for the economy as a whole, confirming a longer term shift in underlying economic dynamics, towards a nation of renters. While single-family housing starts may be underwhelming, apartment creation will be necessary for affordable housing over the next decade. And while the consensus that the taper didn’t affect the overall recovery, but did slam housing, seems to be true, lumber futures – a good gauge of where markets think housing will go – have been going strong. It’s clearly true that tapering, and tightening in general, will slow the recovery of housing relative to recovery of the economy as a whole. But that’s not necessarily a bad thing. Rents are a superior gauge of economic activity as they are more reactive to underlying labor market indicators – like job creation, consumer confidence, and employment – than home prices which ultimately reflect an asset and hence are sensitive to the magnitude of the initial drop in price. Sure, single-unit construction dominates the market. Yet homebuilder ETFs have shown a stronger recovery than housing prices in general, or one-unit construction in specific, would suggest. The market, I think, is pricing in the eventual need to vastly improve America’s multifamily apparatus, as there are no signs a decline in home ownership will halter. And, as I’ve written before, the argument that student loans reflective of inadequate demand is holding back housing is not strong. Fact is, an overwhelming number of students want to live in places where they can’t afford to buy a home. So if the argument is that further monetary accommodation will improve the housing market, I’d buy. However, that’s different from the argument that high investment in single-unit housing is the weakest link in the recovery. And the Fed shouldn’t be making choices about structural trends. I’m in favor of keeping rates lower for longer only as an insurance that the left tail of doing too little is worse than the expectation of doing too much. Not all labor market indicators are decidedly healthy – employment of 25-54 year olds, for example – and current levels of inflation aren’t overwhelming enough that we can be sure they’re here to stay. We can afford to be a little behind the curve.